It seems a tiny little sweet-smelling ball of tea. Drop it into almost boiling water and voilá, it blooms. 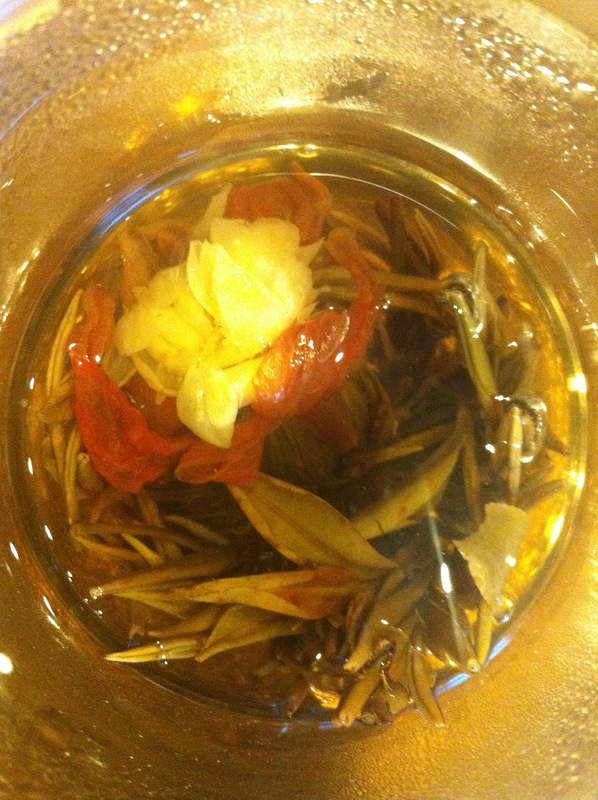 Smells beautiful (jasmine and green tea and chinese lily... dreamy), looks fascinating and tastes like green tea. Gets a bit too jasmine-y taste-wise after it's stewed for a while but the whole house smells divine afterwards. Hi Maeve - I have an award for you over at my blog, so I hope you enjoy it. I love the photos here and the link to the Burda on your dress post is great - I get Burda magazines in Dutch as I have never found them in English - are they available in Ireland? Anyway well done - it's lovely to have a dressmaker's dummy or whatever those figurines are called. My granddad was a tailor so it's in the genes but I have more time for knitting these days!